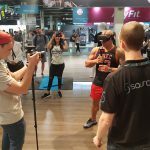 We've presented the upcoming "virtual fitness reality" game PowerBeatsVR for the first time to the public - at the international FIBO 2018 fitness fair in Cologne, Germany. 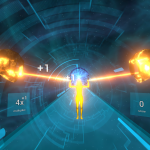 The game is a rhythm-and music based experience with style elements taken from games like AudioShield or BoxVR. It is unique in its focus on fitness though; not only is the game exhausting and requires players to use their full room-scale environment, it also includes actual fitness exercises which have to be mirrored by the player. The game can also be played with an EMS suit (by VisionBody) and will control the EMS impulses. 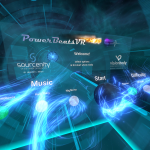 Find out more about this game on the PowerBeatsVR dedicated web page. Today, we officially launch our unique blend of commercial EMS fitness suits and VR. We are proud of how far we have come in such a short time. A few months ago we only had the idea “Why not integrating existing EMS fitness suits into a VR experience?”. And today, we can show you our upcoming VR fitness experience PowerBeatsVR where we have integrated one kind of these EMS suits. Check out the video below to see the EMS Fitness Edition where the game controls the suit in a precisely timed way for an intense full-body workout. We are stoked by this combination of already available EMS suits and VR, as it enables so much: Gamified EMS workouts as well as applications or games which can stimulate your muscles from a slight massage to real tension for the purpose of accurate feedback. We hope that more people will see the potential of this amazing technology, of electrical muscle stimulation for giving feedback or intensifying workouts in VR. The hardware is already there. We will showcase our first EMS powered VR experience PowerBeatsVR at the international fitness exhibition FIBO in Cologne, Germany, from April 12th till 15th, in collaboration with VisionBody, a commercial supplier of EMS suits. 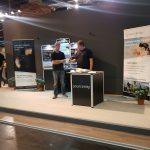 If you’re interested, stop by in hall 5.2, stand A42, and try it out. We guarantee that you will feel your heart beating after one round. 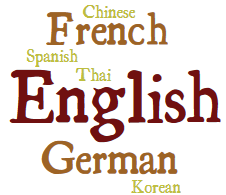 Escape!VR – Above the Clouds has been updated to version 1.2 on Steam – we now include support for French, Chinese, Korean, Thai, German, and Spanish in addition to English. Escape!VR – Above the Clouds is now available on the Oculus store with native support for Rift+Touch. Enjoy! Native support for Windows Mixed Reality! We’re thrilled to have Escape!VR -Above the Clouds- available on the Microsoft store. 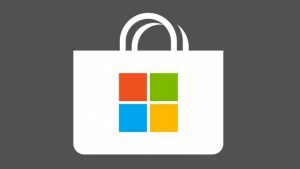 Grab your copy directly from the store built into Windows, and escape! Windows Mixed Reality headset + controller support has arrived as a free add-on to SteamVR. Escape!VR -Above the Clouds- fully supports WMR now – be sure to get your copy! Escape – Above the Clouds! Good news everyone! We have just released the second installment of the Escape!VR series - Escape!VR -Above The Clouds-! Prepare to escape a penthouse in a mile-high building! You can find the game (20% off launch rebate!) on Steam (store.steampowered.com/app/566970/) for Vive & Rift. The Basement in the Oculus store! Good news for Rift+Touch owners! Escape!VR -The Basement- is now available with native Rift support on the Oculus app store. For more information, see here https://www.oculus.com/experiences/rift/1245663708851446/ – or get it from within the Rift experience as usual. Happy escaping!